I picked up the Rancho Gordo Chipotle Hot Sauce from the Revival Market here in Houston. It was my first trip to the market and I was impressed not only by their products, but the environment and feel of the market. I fell in love with their labels and bottles – on everything from maple syrup to olive oil. 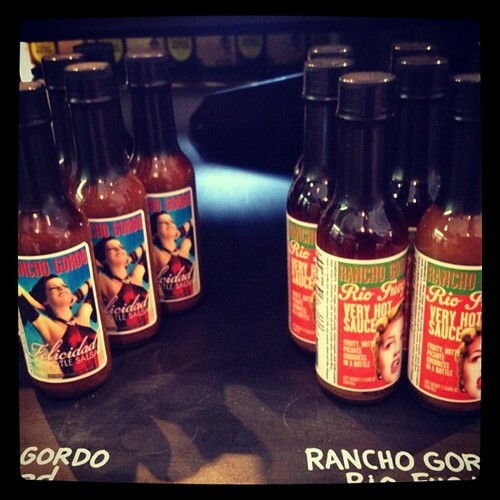 And of course, like a homing missile, I found the hot sauces rather quickly. Since the sauces were $10.95 each (markup much?) 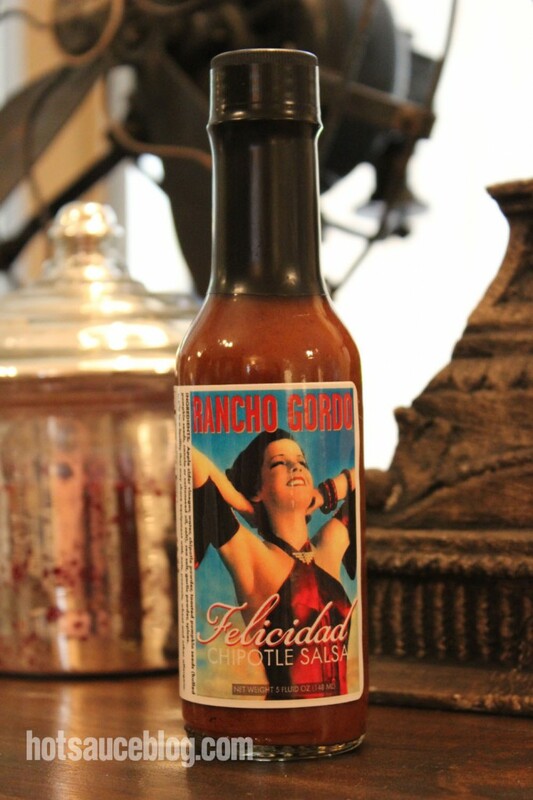 I decided to only get one – so I picked out the Felicidad simply because of the label. And I really didn’t want another “super” hot sauce to review that might end up not being “super” hot. Side note – you can follow the HSB on Instagram (user name: hotsauceblog) or follow the HSB Tumblr site to track all the images taken while on the move. Honestly, reading the label of ingredients on this sauce left me a little dubious as to how it was going to taste. Chipotle powder instead of peppers? Pumpkin seeds? Upon opening the bottle, the aromatics in the sauce hit my nose like a bug on a windshield. There’s no mistaking that this is a chipotle sauce. Still, I first tried this sauce using a spoon – not wanting to ruin an entire meal just in case it was a dud (we’ve all done that before). Wow, the heat in this is formidable. It’s not a super hot – but it sticks in your mouth creating a nice toasty burn. I first tried the sauce on some leftover Cincinnati Chili – but I will save you the image of the brown sauce on brown food – not pretty. 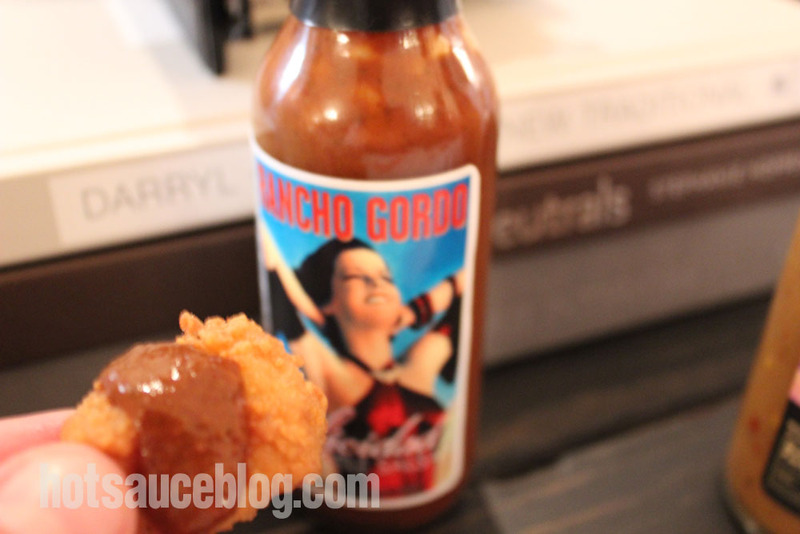 But taste wise – this sauce hit it out of the park. Strong chipotle flavor with a background hint of the toasted pumpkin seeds – this sauce develops it’s flavor in layers. I’ve been using this sauce all week on every meal – I’ve yet to find something it doesn’t go with (sushi perhaps). 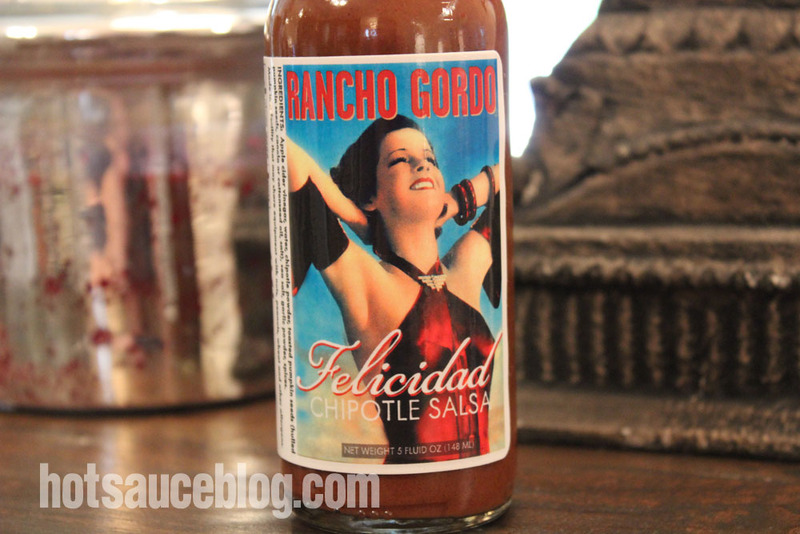 It’s a sauce that’s not so hot that my wife can’t use it – and it’s got a great label. I love finding products like these that surprise you around every turn. 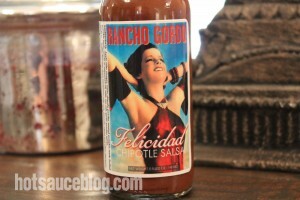 This is a sauce I will be ordering more of – one for the collector’s shelf and many more to eat. Go now and order yourself some bottles, you will soon be singing it’s praises as well. I can’t wait to try their other sauces now! Disclaimer: This product was purchased by the HotSauceBlog.com for purposes of review. Interested in getting reviewed? Please see the Product Reviews & Submissions page. Thanks for the nice review. I’m glad you liked the sauce and flattered that you took the time to write it up. It took us just short of forever it seems to get the sauce just right but I think we pulled it off. The only thing wrong with this sauce is that they don’t sell it by the gallon…. I’ve developed a serious jones and am placing multiple bottle orders regularly. don’t be deceived by this ‘sauce’, it sneaks up on you, quickly. Taste it like a wine, (then get ready.) Excellent nose. Taste, balanced, chile, delicious. For those who say, This is wimpy? Perhaps you want to blast your food? Me, the heat keeps building. Thanks. Whew!